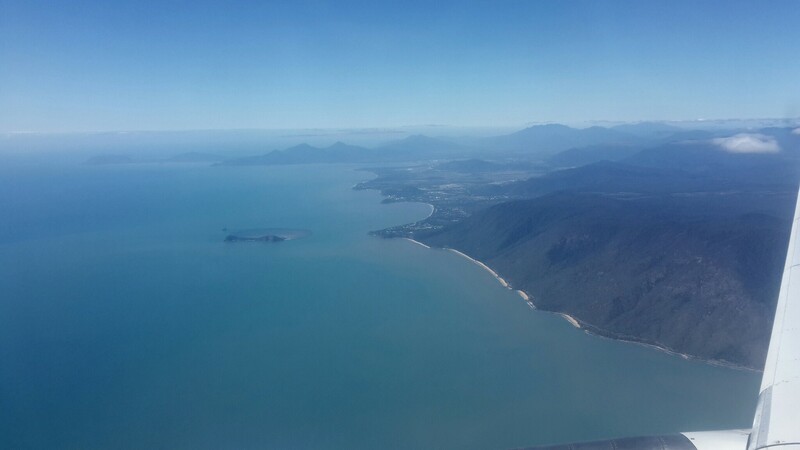 By car, Cairns is 5 hours from Townsville and Magnetic Island. You can also fly to Cairns International airport from any Australian city direct a few times a day, as well as internationally. From the airport there is no public transport going to the city, but you can take a taxi for $20. Also, most hostels have free transfers you can book in advance. If you’ve heard stories about Cairns , you’ve probably also heard stories about Gilligans Hostel. This is hands down the best party hostel I’ve ever stayed at. With over 800 beds, there are always hundreds of people to meet every night. You can stay in 6, 8 or 10 bed dorms which all have an ensuite and are cheap and social. If you want a bit of peace or luxury you can stay in a deluxe 4 bed dorm with a fridge and TV for only $5 more. These are often further away from the bar so you can get a better nights sleep. The club at Gilligans is the biggest in Cairns and is full every night following the various themed evening events. There are two levels and a beer garden, and you get cheap drinks for staying there. Each night they have a variety of activities such as Bogan Bingo, international DJ nights, pool parties and wet t-shirt competitions. If this wasn’t enough, during the day you can relax by the huge pool and fountain to cure your hangover. They offer you great deals on tours and activities and you get a free dinner every night when you buy a $6 drink! 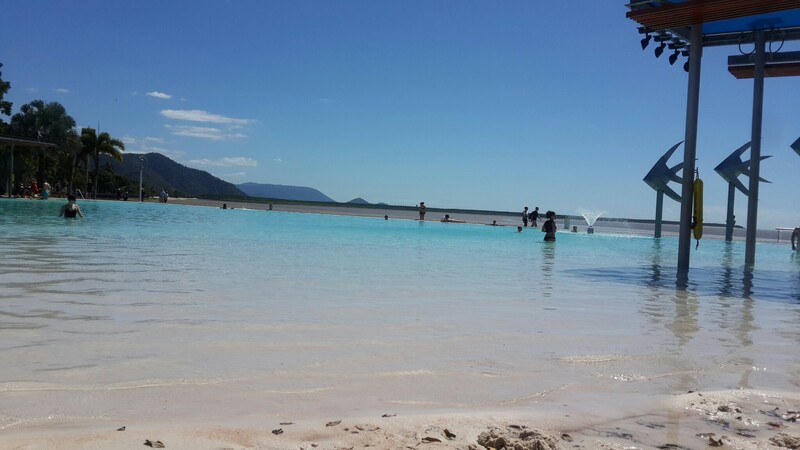 Due to the crocodile infested beaches in northern Queensland, the water is unsuitable to swim in. However, as compensation a beautiful lagoon and man made beach has been developed by the waterfront. This is the ultimate place to relax and is pretty lively everyday with local live music playing. There are also free BBQ you can use so bring some meat down and cook some lunch Aussie style! 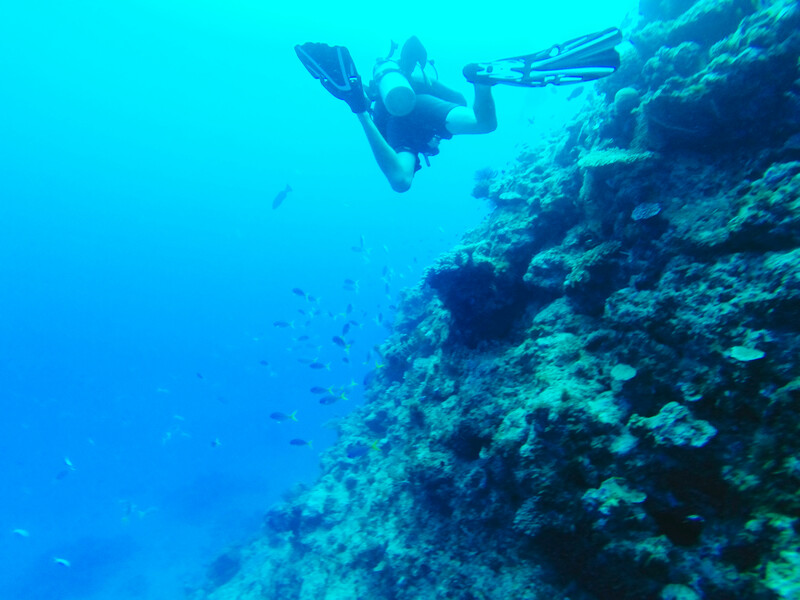 Whether you snorkel or dive, this is a MUST do. 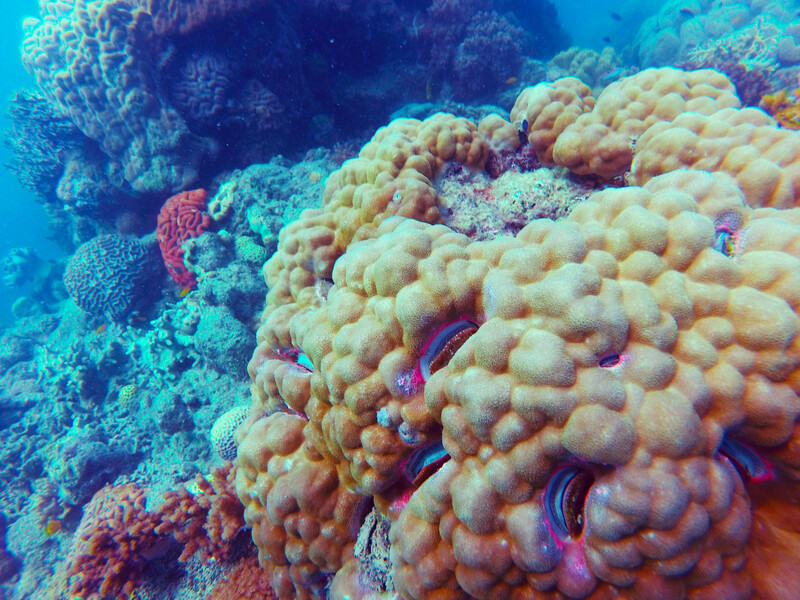 No place in Australia will compare in visibility or marine life. I recommend booking with Deep Sea Divers Den; I did a day trip with them and it was magnificent. 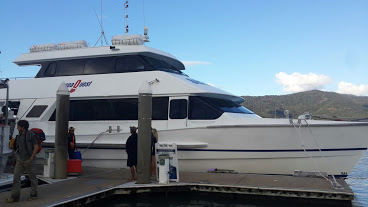 They take you on a huge luxurious boat fitting around 100 out to the reef (we went to Norman reef) where you can admire the gorgeous views from the deck or inside. 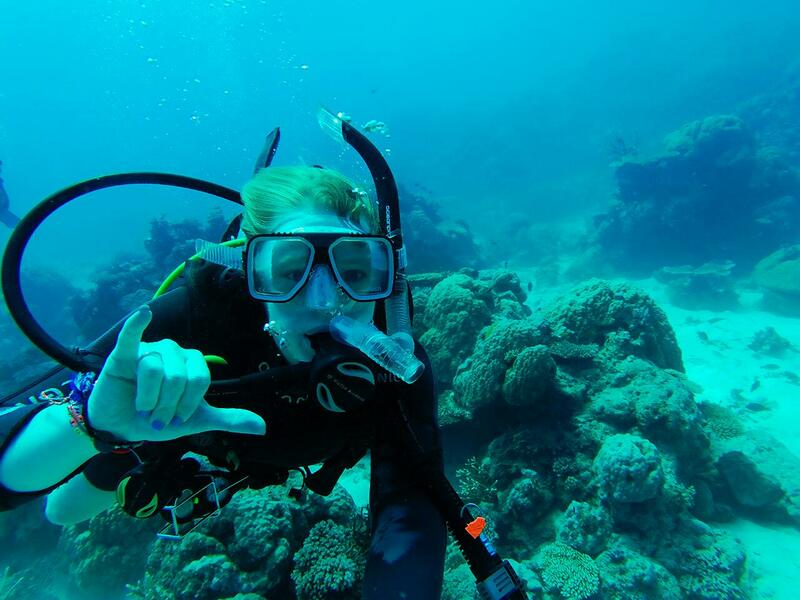 You can either snorkel, do 2 fun dives if you’re certified, or an introductory dive if you haven’t before. 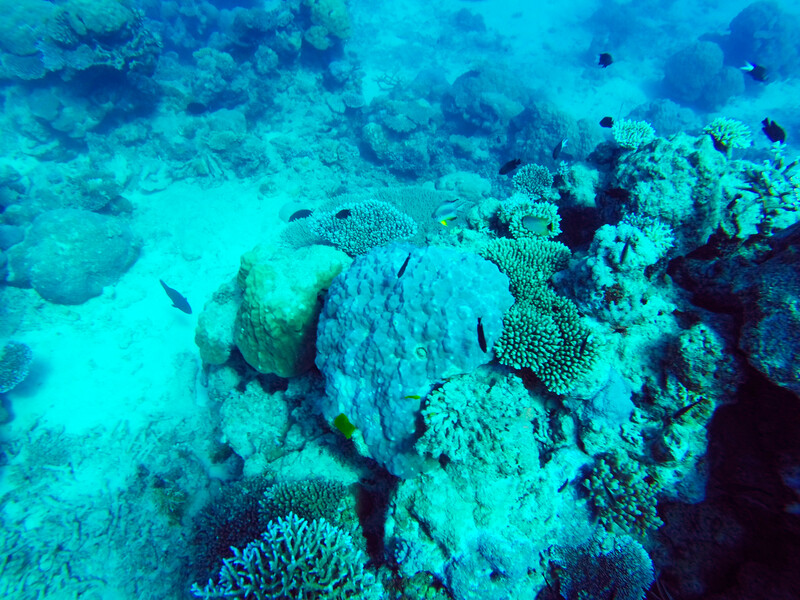 The dive instructors are lovely, enthusiastic and knowledgeable about the best areas to explore. They feed you a delicious buffet for lunch, as well as having free coffee, tea and water all day. They also sell sea sickness tablets, which almost everyone purchased for just $1 (but they worked!). There is a relaxing deck where you can sunbaked as the boat cruises and meet fellow backpackers. This was a great day out and I thoroughly recommend it! You can take a gondola over the World Heritage Daintree Rainforest canopy and its surrounds. This is an amazing way to get a dose of the rainforest for a day if you won;t otherwise be visiting the Daintree. The cable car travels through the tops of trees from Kuranda to Smithfield and you can go either one way or return. If you go one way, you can take the Kuranda scenic railway on the way back for a slightly different view. This will set you back $85 and $100 if you need transfers from Cairns. 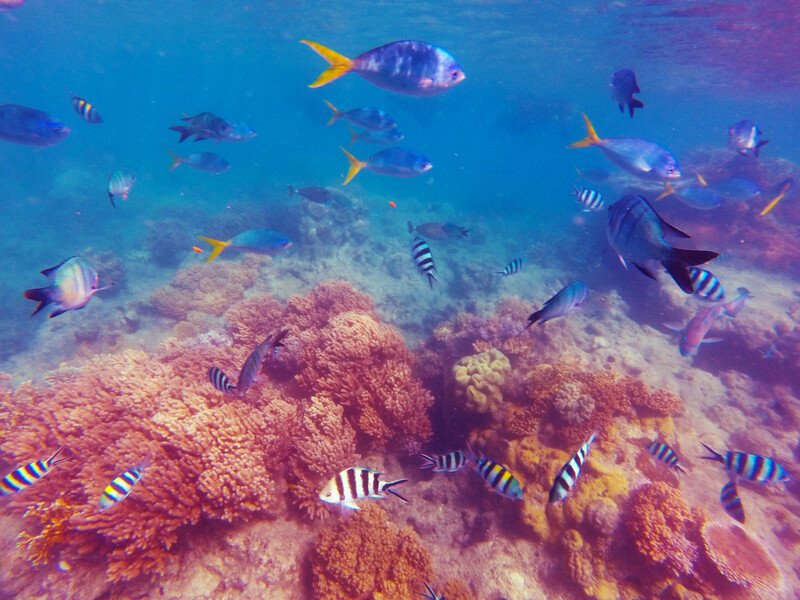 There are two accessible islands you can take a ferry to from Cairns; Green island and Fitzroy island. Here you can lay by the beach, snorkel or indulge in some water sports. It costs $75-$80 return and there are several times per day you can go. 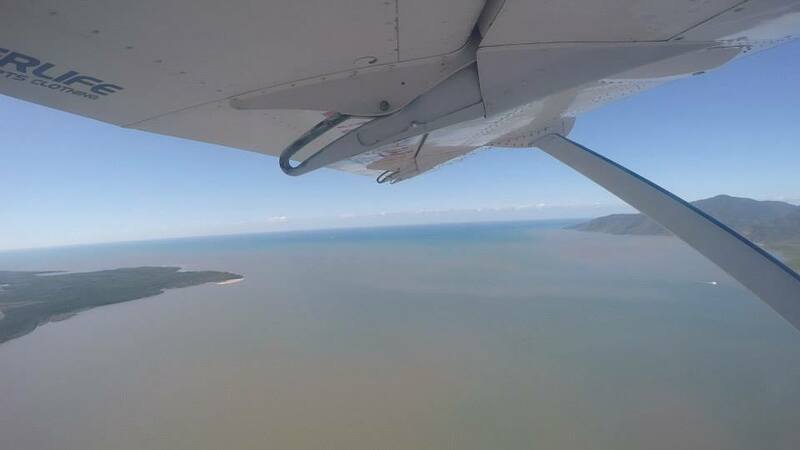 This is one of the cheapest places to skydive in Australia, along with Airlie Beach, at an average $250-$300. 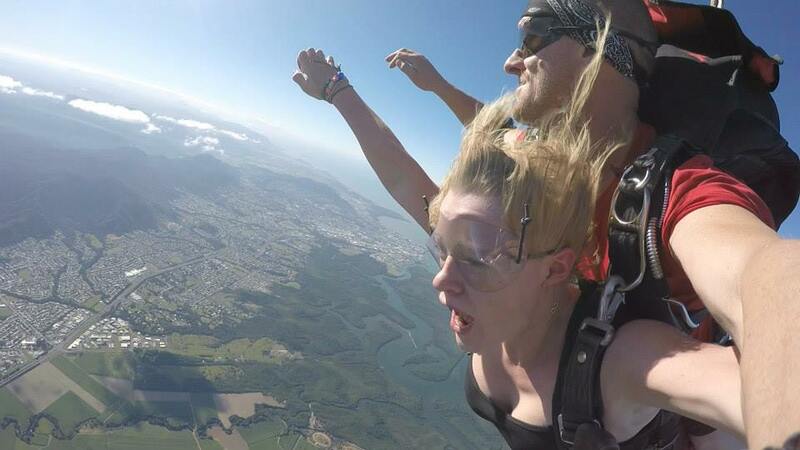 I booked with Paradise Travel who use Skydive Cairns and would highly recommend it! You get transfers to and from your accommodation and once you arrive at the dive centre you get straight up in the air! 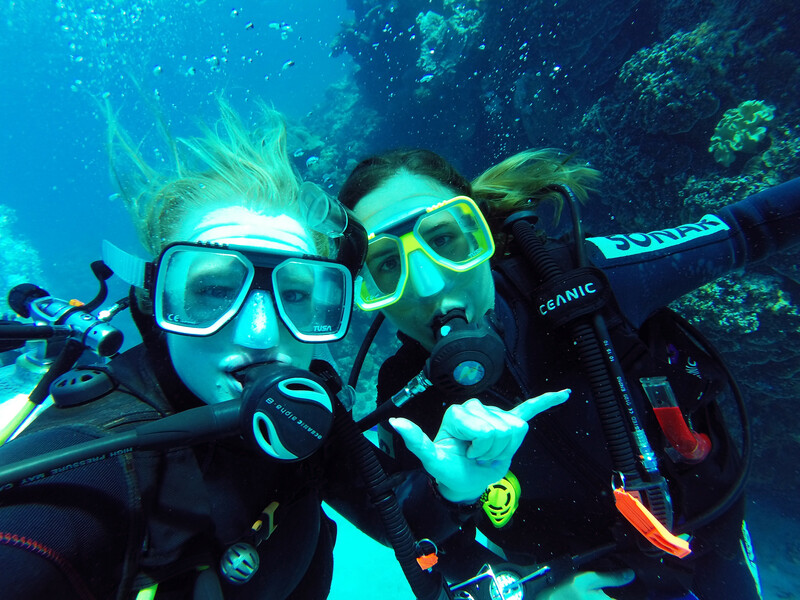 The guides who you dive with are awesome fun and keep your relaxed. You take a 15min scenic flight as you ascend to 14,000ft and the views are phenomenal; Great Barrer Reef on one side and inland mountains on the other. Once you’re at the right height, you roll on over and jump out! You freefall for 60 seconds and then paraglide back down while enjoying a 360 degree view. This is hugely popular in Cairns through the company AJ Hackett and is usually $160. If you don’t want to bungy, you can try their ‘Mingin Swing’ flying fox in a group which is equally as crazy! If you stay at Gilligans, nightlife will never be an issue. They have parties every single night and on weekends open up their second level club, The Attic, often featuring international DJs. There is also a pub crawl for $35 that takes you to a range of bars with a couple of free drinks. You can book these online for cheaper through http://www.bookme.com a few days in advance. However I don’t really think you need the pub crawl, as every bar is so social anyway. PJ O Brien’s has great live music on weekends and always attracts a crowd. Also, the Woolshed has a $10 for 5 drink special and is full of backpackers. I would stay 3 nights plus an extra day for each activity you want to do. This entry was posted in Australia, East Coast, Queensland and tagged Australia, bungy jumping, Cairns, diving, gilligans, lagoon, PADI, scuba diving, skydiving, snorkling. Bookmark the permalink.